The Cyclades are a group of islands just north of Crete and often serve as a popular break from busy Athens. 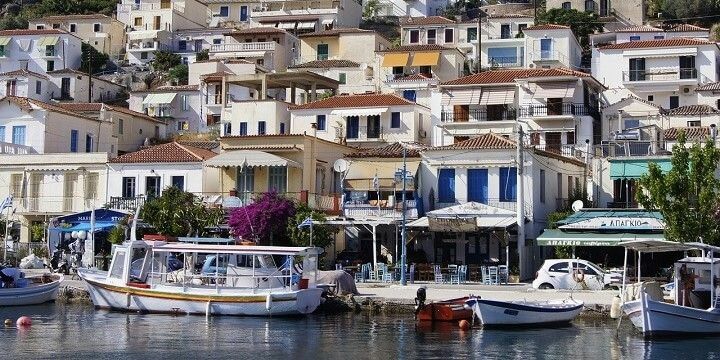 While most travelers have heard of destinations like Mykonos and Santorini, there are far more quaint towns and beautiful beaches to be explored on other islands in this region. 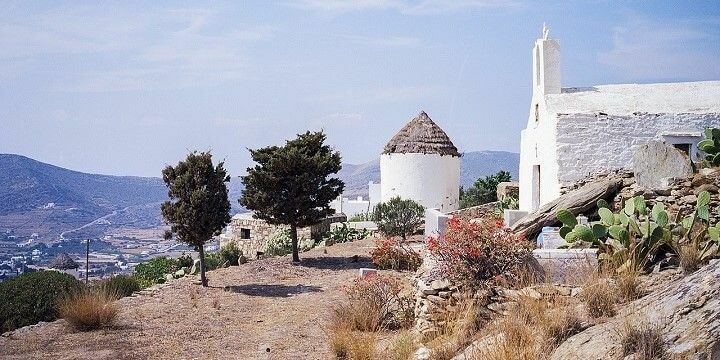 The Northern Cyclades tend to be more popular among locals than international travelers, so they’re great for an authentic and traditional escape. The island of Kea largely comprises of peaceful oak forests, luscious valleys, almond groves, oak trees, and vineyards. Kythnos, meanwhile, is known for its hot springs, located near the busy beach of Loutra. Kythnos is one of the Northern Cyclades. Andros is one of the largest islands in the Cyclades. The main traveler base is Batsi, where you’ll find lots of restaurants, bars, and hotels. There are also many walking and hiking paths all over the island; for example, to the top of its highest mountain, Kouvara. You can also explore stunning beaches, such as Vitali, with its clear water and adrenaline-pumping diving rocks. Start your time on this famous island in Mykonos Town, one of the best-preserved historic towns in Greece. In addition to its white houses, you’ll find intricate church buildings, alongside plenty of restaurants, bars, and boutiques. Mykonos Town is one of the best-preserved historic towns in Greece. 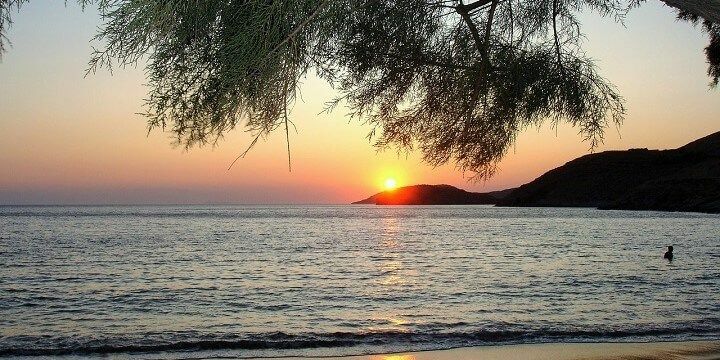 Then, relax on one of the many gorgeous beaches like Kalafatis, Platis Gialos, and Ftelia. These all have unbelievably turquoise water and offer great watersports facilities. During your time on Mykonos, be sure to take a short trip to the nearby Delos island. Popular among history buffs, this is said to be the mythical birthplace of the Greek god, Apollo. You’ll find lots of ancient ruins, temples, theaters, and villas, as well as breathtaking views over the neighboring islands. 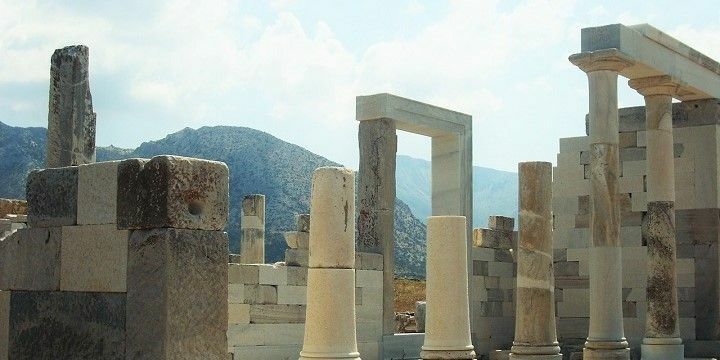 Delos island is said to be the mythical birthplace of Apollo. Most travelers visit Paros for its incredible beaches. In fact, the Windsurfing World Championships were held on the island’s Golden Beach for many years. This sandy stretch, as well as New Golden Beach and Santa Maria are still well-frequented among surfers, kite and windsurfers, water skiers, and more. 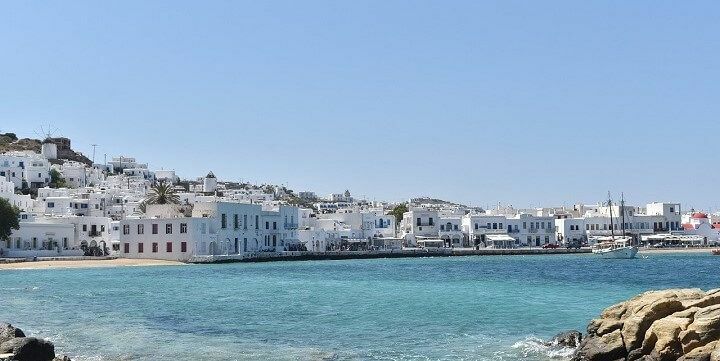 Paros is an island located in center of the Cyclades. While on the island, don’t miss out on Paros Park, home to picturesque walking paths, natural rock formations, and lots of music concerts. After leaving Paros, head to Sifnos, home to up to 365 churches, depending on what you read. The most popular is the Chapel of Seven Martyrs, sat on top of a large cliff, offering stunning ocean views. 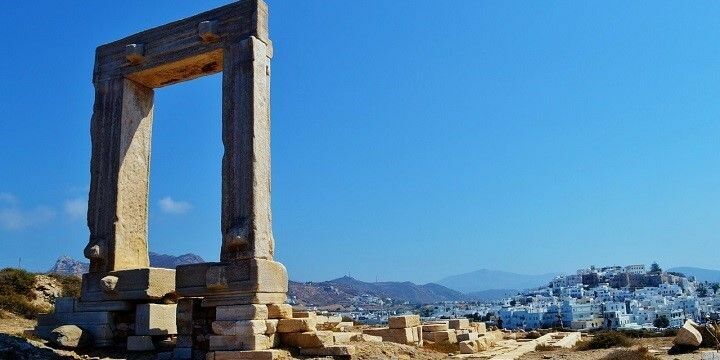 Alternatively, spend some time on Naxos, where history nerds can marvel at Portara, a large marble gate, which is the only remnant of a seventh-century-B.C. temple dedicated to Apollo. The marble gate Portara is located on the island of Naxos. Naxos also has plenty of white sand beaches, including Agios Prokopios and Agios Georgios. The latter is a little busier, as families enjoy the shallow water and protection from strong winds. A visit to the Cyclades would be incomplete without stopping off at the picture-perfect Santorini. 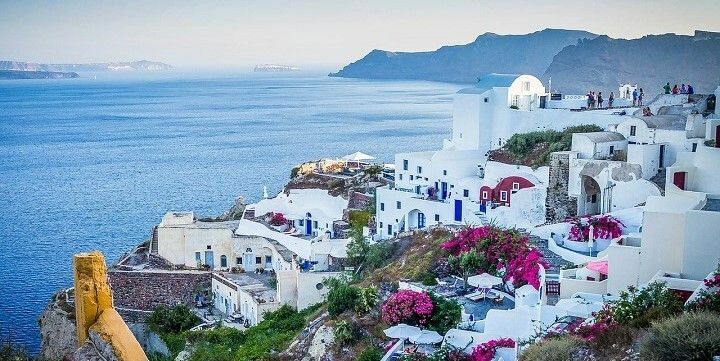 The most-photographed village on the island is Oia, with classic white and blue houses and gorgeous sunset views. Be sure to take the 200 stairs down from the town center to the port of Ammoudi for delicious seafood and exciting cliff diving. Oia is the most-photographed village on Santorini. Nature enthusiasts, meanwhile, should check out the Santorini Volcano, where you can take tours around active craters. If you’re a beach bum, however, you head to Kamari Beach for volcanic black sand, thrilling speed boat rides, and great scuba diving facilities. Looking for some great nightlife? Take a 30-minute high speed ferry ride from Santorini to Ios. You’ll find plenty of clubs and bars along Milopotas Beach and can book a spot on the Ios Bar Crawl, which features six lively bars. There’s more to the island than parties, however, as fitness enthusiasts can enjoy the ten marked hiking trails, while history nerds can visit Homer’s tomb and the Bronze Age Ruins of Skarkos. There’s more to Ios than parties. An absolute perfect trip! It was such a great mix of history, relaxing and adventure! We loved the activities that we did while we visited as well. Great beaches, food, shopping, and wine! Each area that we visited was different than the last which was fun for us. Caldera Yachting experience in Santorini! 2 days in Athens was more plenty! Don't only stay on the famous islands.